Terralift is a technological breakthrough in soil restoration. It solves a number of soil problems including compaction, saturation, and improper drainage, without disturbing the ground surface. It rejuvenates exhausted leach fields quickly without costly excavation and replacement. What Does Drainfield Rejuvenation Do? Terralift provides a fast solution to many ground water problems. 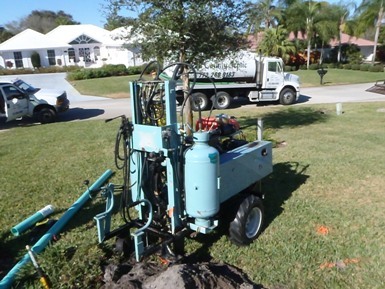 Terralift uses a long, narrow probe and an integral pneumatic hammer to penetrate the soil to depths of from 3 to 6 feet, which forces air into the soil at a controllable rate, fracturing the soil, and creating an aerobic condition. Because air tends to follow the path of least resistance the air will move horizontally and vertically through the soil breaking up clogs. 1) "We are ecstatic with the results of the Terralift. We keep waiting for things to slow down and back - up, especially with all the rain this weekend, but so far, everything is working great. In fact, things are working better than they ever worked since moving into this house in 1989. (You push the silver lever and everything goes away!) The toilets started to work immediately. The shower needed a good plunging (hair stuck in the drain from when the water wouldn't drain) and has been working perfectly since." 2) "Please consider this as the strongest possible testimonial for your recent services using the Terralift septic field machine at our home. My grown daughter, grandson and mother all unexpectedly moved into our home. These additions meant a total of eight family members were using a septic field that was built approximately thirty years ago. The drain field was soon overwhelmed and effluent was leaking out on the road. Thankfully, the winter weather kept the smell from reaching our neighbors.Estimates to replace our drainfield were very expensive. We thought we had no choice but to replace our entire drainfield. My wife was also not very pleased about the destruction of our existing lawn during replacement. My wife and I were very skeptical when you told us that, at a fraction of the cost of a new drain field, the Terralift system could solve our problems in about one hour and preserve our existing lawn. However, we were desperate and decided to try the procedure. The Terralift system is Incredible! Every promise you made about this procedure was absolutely true. I don't know exactly how this system works, and quite frankly, I don't care. I just know that the Terralift system saved our family thousands of dollars, protected our existing landscape and gave us back the complete use of our facilities! We strongly recommend your services and the Terralift system to everyone who may be facing the same drain field failure that we experienced. Believe it or not, it was a real pleasure to write a check for your services with the Terralift system, because it saved us thousands of dollars and it gave us back our piece of mind. Bravo!"